Nothing says low profile like a fiery explosion. After nearly two decades under the Eidos/Square-Enix banner, developer IO Interactive parted ways from its previous publishers last year but retained the Hitman IP. Its first original venture in a post-Square world is Hitman 2, now under the Warner Bros. banner, a direct sequel to 2016’s episodic release. What’s here is very much a continuation of the 2016 game, offering the same strengths and weaknesses as its predecessor in this area. Interacting with the environment is critical as you’ll collect weapons and other items of opportunity (e.g. poison, knives, rancid food, etc.) on site, all of which is contextual where pressing X picks up an item. Tons of actions are controlled with X, however, so there are times where things overlap and become a little unwieldy. Stealth is your ally in Hitman 2, and as usual the game encourages you to get creative with taking out your targets. Approaching an item you can interact with will bring up another prompt, allowing you to sabotage it provided you have something suitable to the task in your inventory. Blunt force is also theoretically possible though not recommended. Agent 47 isn’t superhuman, and the actual gun mechanics aren’t great, meaning you’re likely to get overwhelmed in a firefight. Instincts make a triumphant return, approximating 47’s innate abilities as an assassin by allowing you to sense your surroundings. Here you can see active threats, individuals that can see through whatever disguise you’re wearing, and, of course, your target(s) wherever they are. This allows you to formulate a plan and is imperative to success on higher difficulties. It’s not an original idea, but it’s implemented effectively and works well. 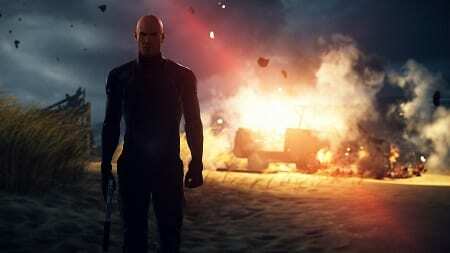 There are two divergent elements to Hitman 2‘s graphical presentation. Let’s start with the good where large detailed levels are once again on offer, and though some may shine a little brighter than others, they all feel like great care was taken to lay them out, populate them with NPCs and then give your version of Agent 47 all manner of ways to eliminate hostiles (or, if you so desire, non-hostiles). Animations are clean and variety is one of the game’s strengths. On the opposite side of the scale is the cut scenes. They’re not fully animated, instead relying on still images with narration over the top. We didn’t realize what was going on initially, thinking maybe some element failed to load properly when 47 and Diana‘s lips didn’t move, but it’s just a bargain basement approach that feels wholly out of place in a series with Hitman‘s lineage. There isn’t much to sink your teeth into when it comes to dialogue, though the familiar voices of our protagonists return intact. Targets and other miscellaneous NPCs are alright, though the aforementioned narrated sections fail to inspire. Effects and ambient sounds hold up quite nicely. Although Hitman 2 scraps the episodic release of its immediate predecessor, it very much retains the feel with its distinct locations rife with different approaches to the main job and numerous additional threads to be followed. That means that while the game is relatively short on locales, each one is treated like a sandbox that can be played through multiple times, exploring and taking unique approaches to accomplish your goal(s). What’s also retained is the overriding feeling that the story is completely unimportant, and what is there feels like a B movie with silly fanfic-esque call signs like Shadow Client, Providence and The Constant. Basically, 47 and Diana are trying to weed out an underground organization that’s using its influence to manipulate world events. Within this is 47 regaining some repressed memories to add a personal edge to the story. While the story falls flat, both in content and delivery, the thrill of becoming 47 hasn’t dulled with age. In fact, IO Interactive keeps upping its game when it comes to providing you with options for taking our your targets. Sure, you can still call upon 47’s trusty garrote or silenced pistol, but that doesn’t even scratch the surface of the possibilities. Dress up like a flamingo and push someone down an elevator shaft? Sure. Feed a drug lord to his pet hippo? Sounds good. You can grind up a target into bricks of blood-soaked cocaine, poison the trophy they’ll drink from, sabotage their race car, drop any number of heavy objects on unsuspecting marks and more. It’s the theater of the absurd in the best possible sense. Putting together a truly memorable assassination is deeply satisfying, but it’s also time consuming, and Hitman 2 demands patience as one misstep can undo everything you’ve done to that point. Although frequent checkpoints and the ability to manually save at any time allow you to experiment liberally, there’s no rushing aspects of each mission, and that means there are long stretches where everything is quiet. Also playing into that is some uneven A.I. At times the guards and other NPCs seem completely oblivious to your presence and actions — like pressing a button that triggers someone’s death five feet away and not questioning it as you stroll away. Conversely, there are moments where they seem to be almost anticipating what you’re about to do, dogging your attempts to move forward with your plots. Although there are only a half-dozen missions each one is sizable and invites you to replay them with newly unlocked gear and drop points. In addition, Sniper Assassin mode is back, adding co-operative online play, along with a new Ghost multiplayer where you compete against other players. It’s solid fun and favours a much faster pace than the main game. Post-launch you can look forward to Elusive Target missions to extend the game’s life cycle. Hitman 2 doesn’t really cover any new ground, but it saturates its levels with so many ways of accomplishing your mission that it still feels fresh, interesting and entertaining. This entry was posted on Friday, November 16th, 2018 at 12:25 am	and is filed under Herija Green, Video Game Reviews. You can follow any responses to this entry through the RSS 2.0 feed. Both comments and pings are currently closed.